We may have just celebrated Halloween, but that doesn’t mean pumpkins have to disappear! Outside of pumpkin pies and fall decor, there are many yummy ways to use this squash! Roasted and tossed in an arugula salad, added to soups or stews, it’s even delicious in risotto! Make sure you buy the correct pumpkin to cook with so you have the best results. You want to buy sugar or pie pumpkins. They are smaller, easier to handle and have a wonderful flavor. The big carving pumpkins that most people buy are bland, watery and a pain to work with! It's easiest to roast your pumpkin before you use it. Start by heating your oven to 400 degrees. Cut off the top of your pumpkin and cut it in half. Scoop out the seeds and cut each half in half. Place on a baking sheet skin sides down and drizzle with olive oil and salt and pepper. Roast in the oven for 25-30 min or until the pumpkin is fork tender. Peel off the outer skin with your hands and cut into a large dice. The pumpkin is now ready for any recipe!! 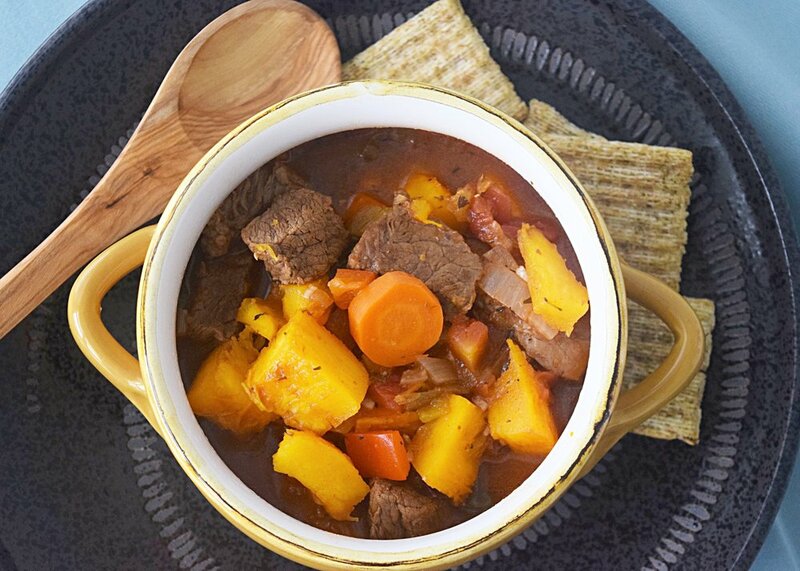 I used roasted pumpkin in this delicious stew that is packed with warm fall flavor. Swiss chard adds a powerful nutrient rich punch to the dish and helps add a wonderful texture. Green chilis may seem like an odd choice for a beef stew, but it adds a subtle spice that warms your stomach! I make this stew on the stove for a fast dinner, but you can also throw all the ingredients in a crockpot and cook on low for 4-6 hours! Add in the roasted pumpkin and Swiss chard 30 minutes before you eat! Heat the olive oil in a large pot over medium high heat. Add the stew meat, thyme and garlic and sear just until all sides of beef are browned. Add tomatoes, chilis, tomato paste, onion, carrots, pepper, paprika and chili powder and stir to combine. Cook until all veggies are coated in spices and tomato paste. Add in broth and cook on low heat for 30 minutes. Add in pumpkin and Swiss chard and cook for 15 more minutes. Remove thyme stems and enjoy! There is absolutely nothing I love more than crock pot meals, I always feel like someone else has made dinner for me. And as an added bonus, it fills the house with the most comforting of smells.This stew is super filling and packed with good for you ingredients! Full of vitamin c, immune boosting garlic and iron and calcium from the rosemary, it's a must eat for Brian and I as we head into flu season. This recipe is a mash up of my moms stew recipe and a barley soup that I used to make. The result was fabulous, rich and filling but also light and flavorful, this stew is perfect for a weeknight meal or a busy weekend. The key to success with this recipe was the use of fresh herbs. Don't substitute the fresh herbs with their dried counterparts, you will definitely be able to tell the difference! In a large pan, heat olive oil over medium heat. Add meat cubes and brown slightly. Add chili powder, tomatoes and fresh herbs.Cook until meat mixture begins to bubble. Add meat mixture to crock pot. Add beef broth and stir. Add all of the remaining ingredients to crock pot. Stir. Set crock pot on low and cook for 8 hours or on high for 5.